The Economist/HSBC Reports - a Timely Warning? The Presidency has asked global banking giant, HSBC, to return all of Nigeria's looted resources stowed in their coffers. 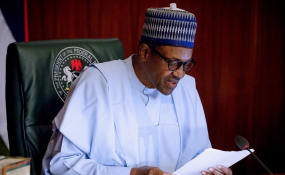 The presidency's call is coming against the backdrop of HSBC's recent declaration that President Muhammadu Buhari's second term would spell doom and stunt Nigeria's economy. "The Presidency wishes to make clear to all Nigerians, and particularly the global banking giant HSBC, which said the second term of President Muhammadu Buhari would stunt the economy, that what killed Nigeria's economy in the past was the unbridled looting of state resources by leaders, the type which was actively supported by HSBC," the Presidency said. A statement signed by Senior Special Assistant on Media and Publicity, Garba Shehu on Saturday said: "A bank that soiled its hand with "millions of US dollars yet-to-be-recovered Abacha loot" and continued until a few months ago to shield the stolen funds of one of the leaders of the Nigerian Senate has no moral right whatsoever to project that a "second term for Mr. Buhari raises the risk of limited economic progress and further fiscal deterioration. "Rather, we ask them to heed President Buhari's constant refrain: return our stolen assets, then see how well we will do. "From the facts available to our investigation agencies, HSBC's put down on President Buhari is no more than an expression of frustration over the administration's measures put in place which has abolished grand corruption, the type which this bank thrives on in many countries. "They may also just be out to discredit the President out of the fear of sanctions and fines following the national assets that are stolen. "With the coming of President Buhari, it is not a secret that corruption, corrupt individuals, banks and other corporate entities that aided corrupt practices are under investigation for various offenses. "For many of them, including their friends in the media, they would rather have President Buhari out of their way, for business as usual to return. "Our investigation agencies believe that HSBC had laundered more than USD 100,000,000 for the late General Sani Abacha in Jersey, Paris, London and Geneva. "Among these accounts on the records are: AC: S-104460 HSBC Fund Admin Ltd. Jersey ($12,000,000); AC 37060762 HSBC Life (Europe), U.K ($20,000,000) and AC: 38175076 HSBC Bank Plc. U.K ($1,600,000). "The bank is also suspected in the laundering of proceeds of corruption involving more than 50 other Nigerians, including a serving Senator as earlier indicated. "In a book, "Secrecy World: Inside the Panama Papers Investigation", published in 2017, Jack Bernstein told the story of global money laundering highlighting the unenviable place of the HSBC. "This is a bank that states and federal authorities in the U.S. forced to pay $1.92 billion to settle charges of money laundering; fined $1.2 billion in Hong Kong for "systemic deficiencies" in bond sales and was made to pay $100 million in currency rigging settlement as reported by The Telegraph of 18th January, 2018."